Food Wishes Video Recipes: Live From New York, It's Sunday Morning! Here are the first two videos from a series of breakfast videos I did for About.com when I was in New York. There are seven in all, and I'll link to all of them eventually. This was quite a new experience for me, since all I had to do was cook the recipe. About had one of their top video producers, Jonathan Stewart, there to film, and eventually edit and publish these videos. 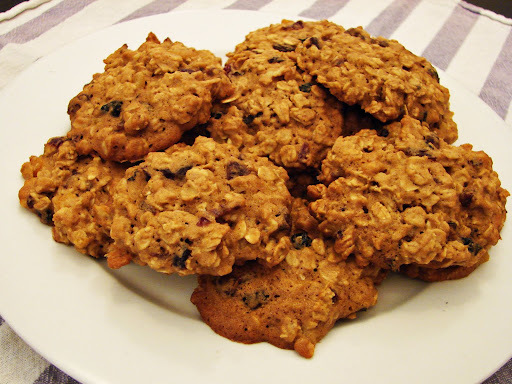 The first recipe is a delicious sausage and mushroom breakfast casserole, and the second, an oatmeal breakfast cookie. Enjoy! Technical Note: Yes, we know the striped shirt I was wearing caused some weirdness, but since I never appear in my own videos, I will plead ignorance. I thought all dark clothes are safe, but apparently not. But hey, I was just the hired talent! I'm proud of ya, chef! I love to see the whole Chef John in action and not just the hands! I liked seeing you, but I think you film the food better than that guy did. He showed the flame, and was always jumping around with the camera. That shirt does look wild on camera. The food looked great. I am expecting to see you on 'The Next Food Network Star!" Quite a change of pace from your usual videos, but I like them both. With your own videos it's like we're there in the kitchen with you, maybe even helping! With the new video, it's like a traditional TV cooking show -- didactic, but engaging. Well done! Keep up both streams! Loved the taped-over KitchenAid spatula! Great video Chef John .... love it! Nicely done! 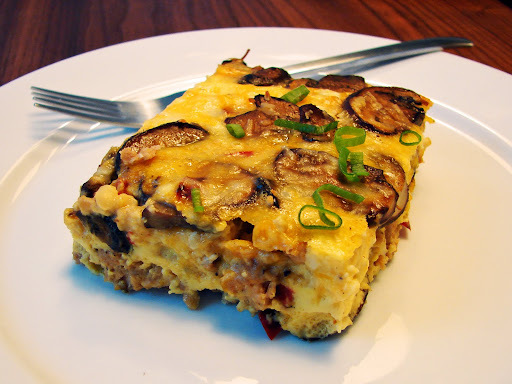 Love the breakfast casserole as well as the oatmeal breakfast cookie. Do you have recipes for these in a printable format? That would rock. Thanks for the post and congrats on the videos. They look great! Thanks!! I agree with you all, but the problem for my mass media efforts is that the tone and pacing of my current videos has no commercial appeal. They want "stand and stir" shows, not stir and do amusing voiceover. Good stuff Chef John. There was a little trick I think you're missing though. When you can't look at the camera because you're looking down at what you're doing, say something about what you're doing. It doesn't even have to mean anything, just continue to engage the camera. For instance, the part where you're looking down at the mixer. That part of the video seems to break the rhythm. If, while you were looking down you were to say, "Now keep an eye on this as it mixes because," blah blah blah. Anything works, and it keeps people's attention. You should always be talking to, or looking at the camera if you want the wider appeal. I know I'd watch your show. Now I feel like I'm being critical, I really did like the videos. And I may use the breakfast casserole for the holidays this year. Looked tasty! I like the old vids better, but understand why you've gone to this format. I think the way you filmed before was easier for me to easily "see" things like pan temperature, food texture/color during key steps, and relative ingredient amounts. But any you is better than no you, so the best of luck. George Clooney lives in Brooklyn? the casserole looks great Chef easy prep good hang time an only two dishs to wash :) going to save it for church brunchs to add some perk.um the 60 second brussel sprouts are they supposed to be crunchy? I cooked two chinese dishs and the sprouts an used a wok to save cook space for all three and wondering if it was a heat issue from not using a large bottom heavy pan? I think you do both formats well and hope to see you on Food Network some day (if that is something you would like to do). I know you are trying to explain to others how the About.com format was different, just don't resort to defending your self for doing a another format. I think your regular audience is mature enough to understand you're trying to reach the next level and sometimes you need too appeal to the masses to do that. Is there any email address or another form of support we can offer to show About.com and/or others that we want to see more of you? Thanks Ed, but not necessary. They will let me do as many videos as I can fit into the schedule, it's just I don't have as much time for them with all the videos I do for foodwishes. Made this for dinner tonight. It's a keeper! If you have trouble watching the video turn off adblock, reload, and click fullscreen.